I've just had one of the most pleasant set of interactions that I've had with a corporation in years, and I wanted to let you know. On two occasions during the last week, I bought a used file at your business, and it was like being in a Rolls Royce dealership. No, I was actually treated better-- like royalty! From my first phone call with Diana a couple weeks ago, everybody bent over backwards to take care of me! I also dealt with Rebecca, Emily, and Jeff. And the men who loaded the file into my car twice had the same customer service orientation. I only spent two hundred bucks, but I will remember Roberts for a long time, return when I need office furniture equipment, and tell others. Everything went very well after I left the showroom on Thursday. The chair was safely transported and moved inside. After some thorough cleaning, I carried it over to my desk and harmony was attained. This model is the ideal shape for my body, and the lower back support is excellent. I almost can't believe it -- no more wobbling and creaking every time I shift my weight! I extend my deepest gratitude to you and Kevin for being so friendly and accommodating at every step of the transaction. 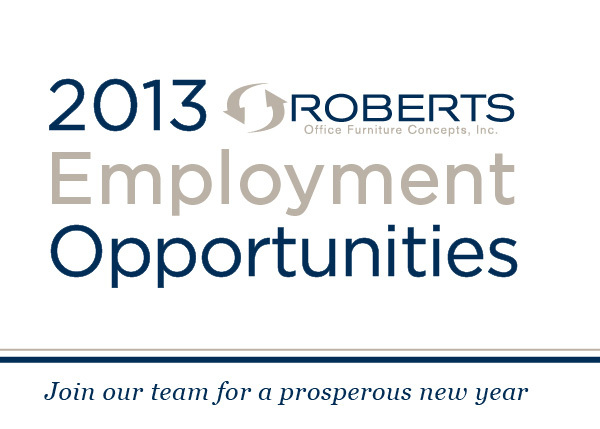 Working with RobertsOffice Furniture over the past year has been an enjoyable experience. They areeasy to work with, provide a great service and are accomodating to your needs.A friendly environment for sure!! We can't thank you enoughfor the great job Robert's did on our home office workstation. Everypart of this process has been pain free, from the initial design stage, rightup to installation. We are thrilled with how beautiful our new officelooks, and can't believe it cost 1/3 of what other companies were going tocharge. What's even better is that we also got to support a localcompany! Thank you again for allyour help, and to all the staff at Robert's. Thanks all for doing a fantastic job with the lab furnishings! It looks beautiful. The panels look great and the install went smoothly. Couldn’t ask for better. Mark and partner (sorry, I didn’t ask his name) were courteous and professional. Truly hoping that SLU and Roberts have another opportunity to work together.